Team members of all the three entities in the group photo. Saudi Aramco President and CEO Amin H. Nasser exchanging mementos with CB&I CEO and CLG managing director at Saudi Aramco headquarters in Dhahran on Thursday. 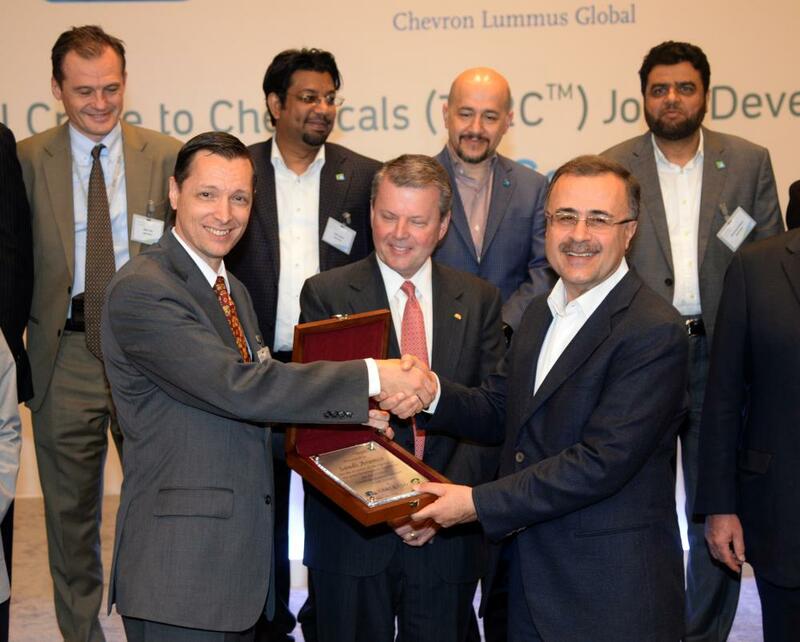 Dhahran– Saudi Arabian Oil Company (Saudi Aramco) through its wholly-owned subsidiary Saudi Aramco Technologies, Thursday signed a three-party Joint Development Agreement (JDA) with CB&I, a US-based leading provider of technology and infrastructure for the energy industry, and Chevron Lummus Global (CLG), a joint venture between CB&I and Chevron USA Inc., and a leading process technology licensor. 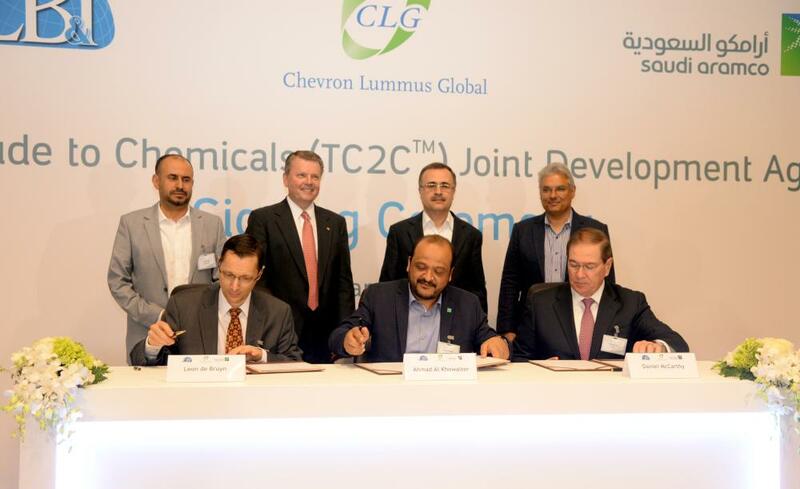 The joint development agreement will serve to scale up and commercialize Saudi Aramco’s Thermal Crude to Chemicals (TC2C) technology. 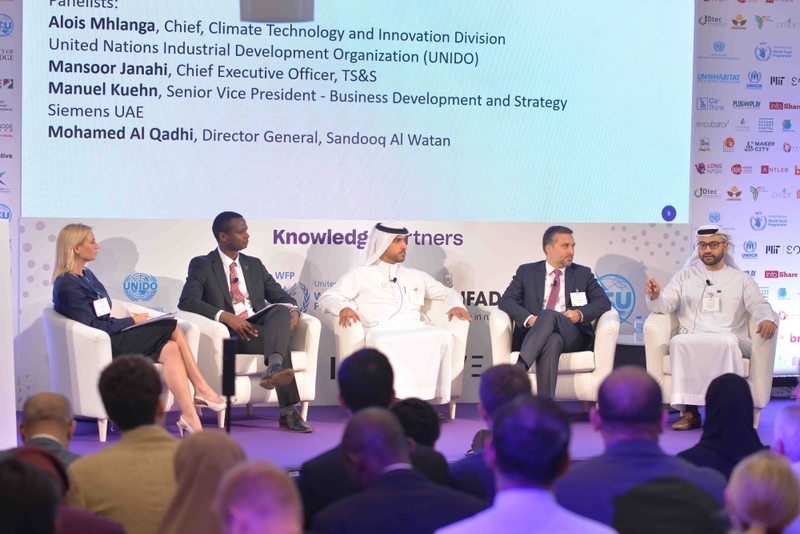 This innovative technology has been pioneered at Saudi Aramco’s Research & Development Center over the past few years in order to enable higher chemicals yield than previously achievable. This innovation also bypasses conventional refining steps by employing a proprietary direct conversion process. This proprietary technology represents significant innovative progress and complements Saudi Aramco’s crude-to-chemicals conventional projects. The innovative and conventional approaches together enable and accelerate the growth of Saudi Aramco’s chemicals business. 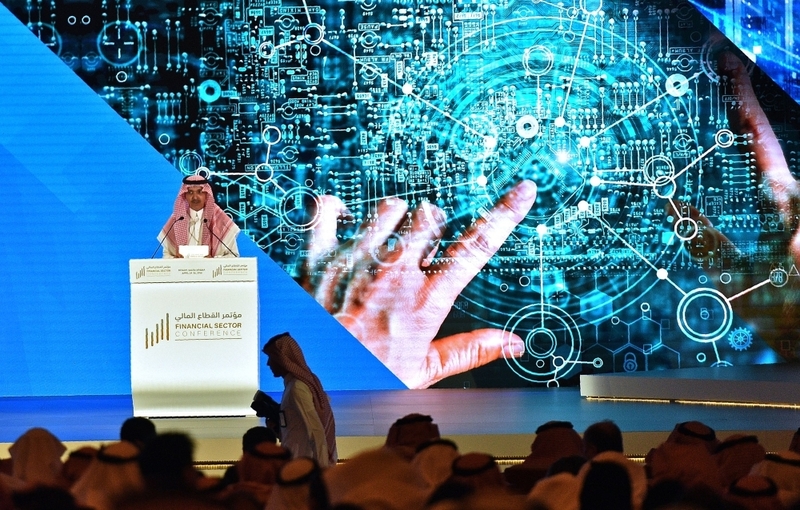 Taking questions from newsmen present at the signing ceremony, Aramco president expressed his optimism at the market stability during 2018. He said OPEC members were sticking to their quota limits. 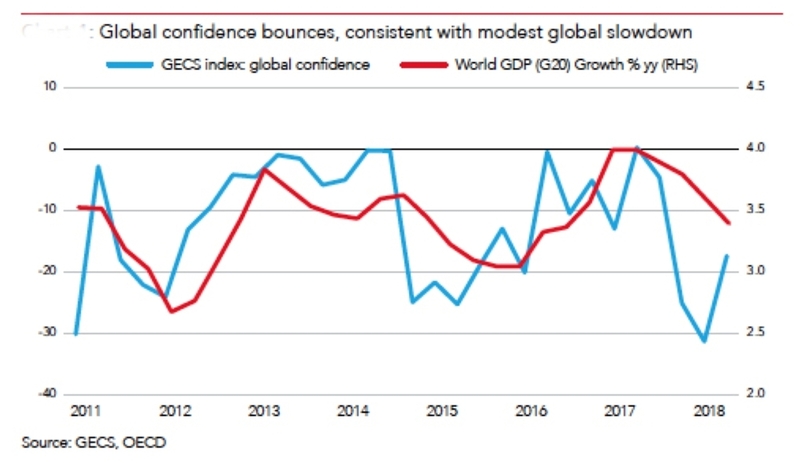 He said if the global oil trend continued its current pattern and the OPEC members remained committed to their quota, 2018 will witness growth in the market and the price reaching reasonable stage. He also attributed decline in production in the US and European Union as another reason for improved market environ for Saudi crude. He said non-OPEC oil producing countries were also supporting OPEC quota and as a result the market tends to improve for all the producers. 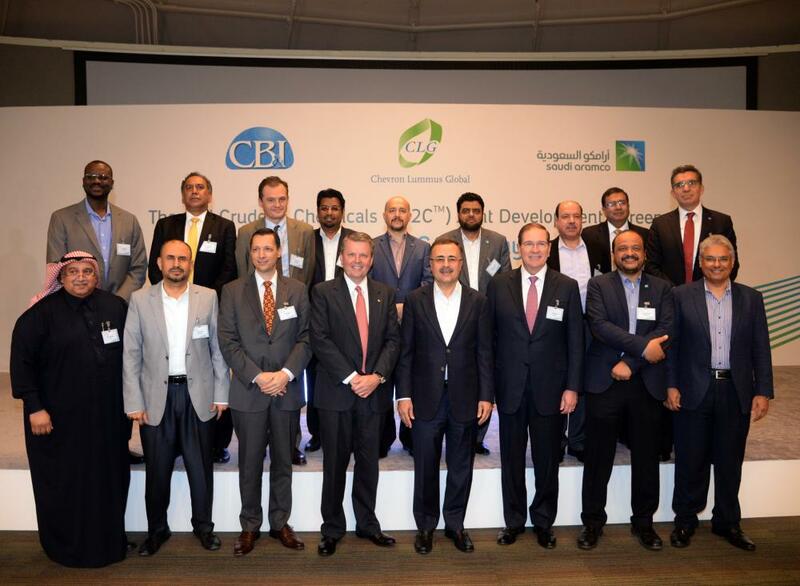 It is an honor to partner with Saudi Aramco to develop the most competitive processing solution for crude to chemicals, said Patrick K. Mullen, CB&I’s president and chief executive officer. “This is a unique integration of advanced technology processes for the production of high-value petrochemicals from crude oil, and our three companies are best positioned to do so,” he said.